Brisbane City Council proudly supported International PARK(ing) Day this year, giving artists, designers and community groups the opportunity to transform on-street parking spaces across Brisbane into creative, people-friendly spaces. PARK(ing) Day encourages people to see parking spaces from a different angle and is a unique opportunity to do something creative to liven up our city's streets. Starting in San Francisco in 2005, PARK(ing) Day is celebrated in more than 160 cities across six continents. 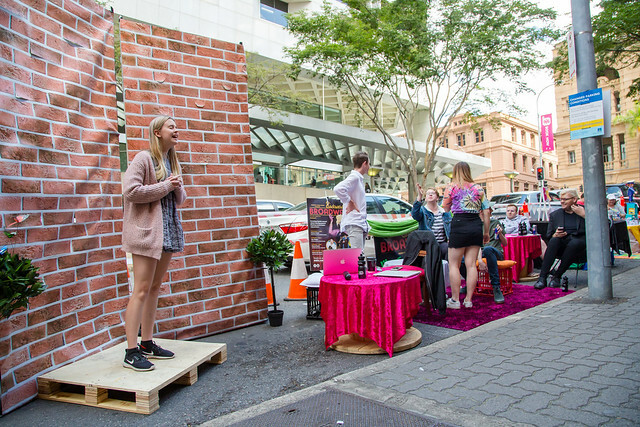 Brisbane City Council recognises the hard work, creativity and passion that teams invested into transforming on-street parking spaces into people places at PARK(ing) Day on Friday 21 September 2018. As part of PARK(ing) Day 2018, the following teams were awarded for their outstanding efforts in creating a vibrant, creative and people-friendly space. Congratulations to all teams who participated in Brisbane PARK(ing) Day 2018 and helped to celebrate our people-friendly city! View photos from PARK(ing) Day 2018 as a slideshow, or view photos individually as part of Council's Flickr account. PARK(ing) Day helps challenge how we think about urban spaces, aiming to encourage people to reduce car dependency and instead consider public and active travel modes. This aligns with Council’s Transport Plan for Brisbane – Strategic Directions which recognises the need for motorists to reduce reliance on private vehicle travel to improve Brisbane’s sustainability, environment and air quality, and liveability. For more information about PARK(ing) Day and to find out how you can be involved in future events, contact the PARK(ing) Day team.